A "core-collapse" supernova occurs when the iron core of a massive star collapses under the force of gravity and then rebounds, generating pressure waves and shocks that propagate outward. A superluminous supernovae is a rare class of core collapse supernovae whose luminosity, equal to 10-1000 billion suns, is too high to be powered by the usual process that drives supernovae, the radioactive decay of nickel (there is not enough nickel present to do it). The source of the energetics has been hotly contested, with suggestions including shocks from the ejected material or pulsating instabilities interacting with surrounding material. The most favored model, however, is the sustained injection of energy from a source like a spinning compact remnant: a neutron star or an accreting black hole. Long-duration gamma-ray bursts are those that last for a few seconds up to several minutes, unlike the more common gamma-ray bursts that last for under a few seconds. The long-duration bursts are suspected of being sustained by the rotational energy of a spinning compact object left behind from a supernova. Superluminous supernovae seem to be associated with these kinds of long-duration bursts, lending support to the idea that they too are powered by a spinning remnant. 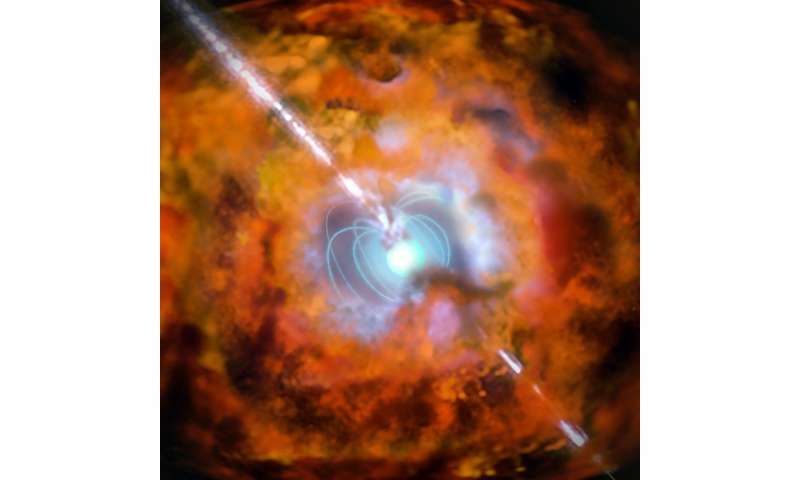 CfA astronomer Matt Nicholl and four colleagues have proposed a unifying model for superluminous supernovae and long-duration gamma-ray bursts in which a spinning neutron star has a slight misalignment between its spin axis and its magnetic axis. The consequence is that substantial fractions of the spinning power are supplied both to the supernova and to a jet of particles moving at speeds close to the speed of light that enabled the long burst. Moreover, the scientists are able to predict the radio emission and thermal wind effects, and to address some of the transient effects that appear in these dramatic events.